The Ibn Tulun Mosque was fully completed in 879 AD. It was built on Mount Yashkur in al-Qata'i, one of the main settlements of the time. Ahmad Ibn Tulun, who constructed the mosque, was the founder of the Tulunid Dynasty which lasted from 608 AD to 905 AD. The Tulunid Dynasty was the first independent dynasty in Islamic Egypt. It broke away from the Abassids, who ruled the Islamic Caliphates at the time. During Ahmad Ibn Tulun's reign, he expanded the empire to Palestine and Syria, as well as small parts of Asia Minor, a large peninsula that connects Europe and Asia. The Tulunid period is known for their administrative, cultural, and economic reforms. The Ibn Tulun Mosque was built over the course of three years, and was the third mosque to be built in Cairo. It is also the third largest mosque in the world today as well as being the oldest mosque in Egypt that has remained in its original form. The mosque is built from red brick, faced in carved stucco, which is a material made of an aggregate, a binder, and water. The mosque is surrounded by three ziyadas, which are outdoor, narrow enclosures and extensions to the mosque. Additionally, the mosque includes a roof which is supported by arcades on piers. The Ibn Tulun Mosque reflects upon all architectural features of the Abassid (dynasty from 750-1258) art. The decorative elements of the Ibn Tulun Mosque reflect back on the traces left of Byzantine influence as well as the political leadership of Samarra from Baghdad in Iraq. In fact, the mosque has evidently been influenced by the Samarra Mosque in Baghdad, in regards to the minaret, the great rectangular piers, and the decorative motifs along with many other features. The facade of the mosque is very simple. The bottom half is very plain, except for the door openings leading into the mosque, and the top half of the facade is taken up by a row of windows. These windows are with stucco grilles, which are made up of various and different designs. Some areas of the Ibn Tulun Mosque, such as the prayer room wall, are decorated with long inscriptions of Kufic, which is a form of calligraphy. The characters of the Kufic calligraphy are carved and engraved in wood. This architectural masterpiece consists of nineteen doors and 128 windows, which have been made with various and great geometric patterns. It is unkown whether these patterns were originally put in, or were from later restorations. The walls are made and enhanced with open brickwork and decorative motifs, which also inidicates Samarian influence and craftsmanship. The mosque also includes a sanctuary in which is surrounded by beautiful pillars, which consist of hand-carved decorations. The Ibn Tulun Mosque includes many architectural elements; ones that are the same as many other present mosques. These elements include the mihrab, the minaret, the ablution fountain, the minbar, and the ziyadas. Each of the architectural elements found in the Ibn Tulun Mosque have their own functions. Minaret: The minaret is where the muezzin, or caller for prayer stands in order to call Muslims to prayer five times a day. Additionally, when the sun heats up the dome of the mosque, air is drawn in through the windows, and then is moved up through the minarets. The present day minaret was a rebuilding by Sultan Lajin, a Mamluk leader from 1297 to 1299. Today, the only original element of the minaret that remains is the square base. The second story of the minaret is cylindrical which is surmounted by later restorations made by the Mamluks. The minaret of the Ibn Tulun Mosque was originally built in brick, and is Cairo's only minaret with a spiraling external staircase. The presence of double-arched windows on the shaft of the minaret and in the entrance to the minaret's staircase indicates Andalusian influence. Andalusian influence had reached Egypt because of the resettlement of Andalusian Muslim refugees who were forced out of their homeland during the Christian Reconquista from 1212 to 1260. The minaret of the Ibn Tulun Mosque. Its cylindrical shape is demonstrated here, as well as the spiral external staircase around the tower itself. Ablution Fountain: The ablution fountain is where Muslims perform what is know in Arabic as 'wudu', which is the process of Muslims cleansing themselves. It is known that before prayer, Muslims are expected to cleanse themselves in order to be clean in front of God. The ablution fountain is located in the center of the mosque's courtyard. The ablution fountain present in the courtyard of the Ibn Tulun Mosque was built on the site of the fawwara, which was a fountain built by Ibn Tulun, but then was later destroyed by a fire in 986. The fawwara's function was purely for decorative reason. The original facilities of the ablution fountain were housed in the ziyyadas, as for hygienic reasons. This is the ablution fountain in the Ibn Tulun Mosque. Inside is where the fountain itself is located. This architectural element is located in the center of the mosque's courtyard. Mihrab: The mihrab is a niche that is located in the qibla wall. The mihrab indicates the qibla; which is the direction of the Ka'aba in Mecca. While praying, Muslims are expected to be facing in this direction. The mihrab in the Ibn Tulun Mosque is in the prayer hall, and was apparently restored during the Mamluk period, which lasted from 1250 to 1517. The mihrab is emphasized upon by a wooden dome. There are two columns on each side of the mihrab; the inner columns are in the shape of a basket, while the outer columns are decorated with branches of grape and vine leaves. The Shahada is stated around the top of the mihrab, and is written in Kufic script. The mihrab on a pier which overlooks the courtyard is attributed to the vizier of the Fatamid dynasty, Al Afdal. This is the mihrab located in the center of the qibla wall. As shows through the picture, the shahada is written on the top of the mihrab in Kufic script. Minbar: The minbar is pulpit in a mosque where the imam, or leader of prayer, stands in order to deliver sermons, known in Arabic as khuttbahs. The minbar of the Ibn Tulun Mosque is located next to the mihrab. The colours of the minbar are all different shades of brown with various textures and patterns. At the top of the minbar is the symbol of Islam, the crescent. The minbar is located next to the mihrab which means it is also on the qibla wall. It is where the imam delivers his sermons. Ziyadas: Ziyadas are outside, narrow enclosures or extensions to the mosque. In most cases, they are between the inside of the mosque itself and the outside, and they serve to allow people to recognize they are entering a holy area. The Ibn Tulun Mosque consists of three ziyadas, which are outside enclosures and extensions to the mosque. The walls of the ziyadas are surmounted by a unique and speical crenellation, which is a defensive wall built around the top of a castle, or in this case a mosque. As well as the crenellation, the wall of the ziyadas are also surmounted by fortified parapets, which are wall-like barriers, with solid parts as well as openings. The crenallation and parapet indicate Samarra influence on the mosque. Hand-carved pillars in the Ibn Tulun Mosque. The entrance to the Ibn Tulun Mosque. *All pictures that are not linked were taken by Nour during the trip. Bibliography:1. "Egypt: The Mosque of Ahmad ibn Tulun." Egypt Travel, Tours, Vacations, Ancient Egypt from Tour Egypt. N.p., n.d. Web. 19 Dec. 2010. <http://www.touregypt.net/featurestories/ibntulun.htm>.2. "Ibn Tulun Mosque." ArchNet. N.p., n.d. Web. 19 Dec. 2010. <archnet.org/library/sites/one-site.jsp?site_id=2070>.3. "Islamic Architecture In Egypt: Ibn Tulun Mosque...The First Decades." Islamic Architecture In Egypt. N.p., n.d. Web. 19 Dec. 2010. 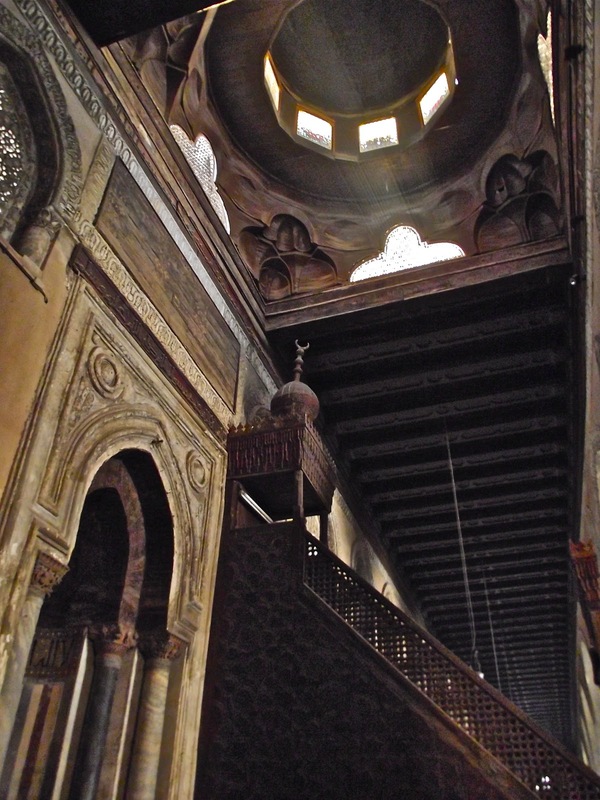 <http://islamicture.blogspot.com/2008/10/ibn-tulun-mosquethe-first-decades.html>.4. 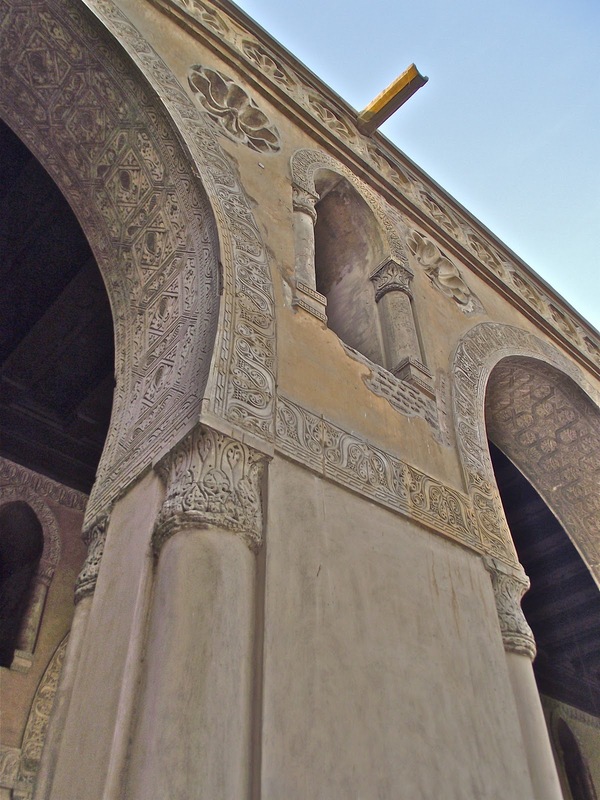 "The Mosque of Ibn Tulun â€“ Cairo's Oldest Surviving Mosque." Suite101.com: Online Magazine and Writers' Network. N.p., n.d. Web. 19 Dec. 2010. <http://www.suite101.com/content/the-mosque-of-ibn-tulun--cairos-oldest-surviving-mosque-a291159>.